This is the last known photograph of Lonnie Donegan in performance. It was taken by Mrs Anette Taylor at the Nottingham Royal Concert Hall on Wednesday 30th October, to record a piece of family history. Four days later, Lonnie died in Peterborough. The story behind this photograph is well worth telling. 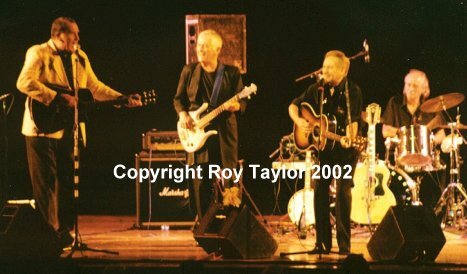 In 2001, I saw Billy's former flatmate, Vince Eager, perform at a folk festival near Grantham, Lincolnshire. Lonnie Donegan was on the same bill, and Vince told me the tale of how Lonnie encouraged him to make a start in show business. Vince confessed that one of his last remaining ambitions was to appear on stage with his hero. When Lonnie's tragically prophetic This Could Be The Last Time tour started, I contacted a member of his management team and asked if we could fix it for Vince. Initially, I received an unqualified: "Yes" but as I have learned in the past, you can never take anything for granted in the entertainment business. I won't go into details, but it took a little fancy footwork before Vince knew that he would finally be appearing on stage with Lonnie. What do Paul McCartney, Joe Brown, John Lennon, Marty Wilde, Billy Fury and Vince Eager have in common? Answer: if asked who inspired them to take up music, the answer would be, skiffle king Lonnie Donegan. Music critics and musicians refer to Donegan's skiffle music as the roots of British rock. Many 1950s teenagers were musically weaned on Lonnie Donegan and did their best to emulate him - even to the exclusion of Elvis, who didn't influence the teens musically to the extent Donegan did. For 16-year-old Roy Taylor of Grantham, playing Donegan’s music was not enough. He had his first taste of Donegan one Sunday night at the Granada cinema when he endeavoured to follow the bouncing ball during a sing-along to Donegan's first number one hit, Rock Island Line. The following morning Roy purchased the record, went home, put the arm up on his Dansette record player and left the record to play over and over again. As a member of The Vagabonds, a well-known local harmonica trio, Roy felt his vocal aspirations were being denied by all the harmonica playing. Within hours of taking custody of his now most cherished possession, his The Rock Island Line recording, Roy persuaded his harmonica-playing pals, Brian "Liquorice" Locking and Roy Clarke, to invest in a tea chest bass and a guitar and include Lonnie's music in their act. The subsequent addition of a washboard player, and many hours of rehearsing the songs on Donegan's first album, transformed the Vagabonds Harmonica Trio into the Vagabonds Skiffle Group. Roy became a Donegan disciple. Records, photos, articles and playing and defending Donegan's music before his elders, proved Roy's allegiance. In an interview in the New Musical Express, Donegan was discussing his coming nationwide tour, which included the Empire Theatre, Nottingham. During the interview Donegan declared that any fan wanting to meet him only had to go to the stage door and he would be happy to say hello. Roy saw this as the opportunity to meet his musical mentor and he booked his tickets - 12 times over. His determination warranted a seat at all of Donegan's 12 performances. After the Wednesday first house performance Lonnie recognised Roy from the two previous evenings and invited him into his dressing room. Roy told Donegan of his Vagabonds Skiffle Group and Donegan invited Roy to return with his group to the theatre on the Saturday morning to play a few songs. With a skiffle group audience of Micky Ashman (bass) Nick Nicolls (drums) Denny Wright (guitar) and Donegan himself, Roy and his pals launched into the Donegan hit Bring A Little Water Sylvie. Within a few bars Lonnie and his group had relieved the Vagabonds of their instruments, tuned them, and returned them. Four songs later Donegan declared: "You guys should turn professional, you have something." Completely overawed by the experience the Vagabonds returned to Grantham to continue their spreading of the word of Donegan. In the following weeks, a BBC and Weekend magazine competition was launched. The World Skiffle Championships, to be held at Mecca Dance halls throughout the UK. The Vagabonds entered. During the following months, the Vagabonds made a weekly trek to the Nottingham Palais as they slowly dealt with the competition and made their way into the finals which were to be held shown live on BBC TV. Come the great event and the Vagabonds clinched second place. A disappointment, yet the step up the ladder they were looking for. Following their success the boys were invited to appear at the famous London West End 2 Is Coffee Bar, a venue which produced names such as Tommy Steele, Marty Wilde, Cliff Richard, Adam Faith, Jet Harris, The Shadows and many more. After a few weeks, legendary manager and impresario Larry Parnes, who subsequently took over the boys' careers, spotted The Vagabonds. Within days Roy had become Vince Eager and began his climb up the velvet runged ladder of showbiz and his pal Brian Liquorice Locking joined Cliff Richard's backing group, The Shadows. A few weeks into his new career Vince was invited to a music magazine launch party. Upon his arrival Vince heard a voice above all others shout: "What did I tell you?" It was Lonnie Donegan. Over the years Lonnie and Vince have worked together but never sang together. On Wednesday 30th October at the Nottingham Royal Concert Hall, Vince will perform two songs with his mentor. The story has gone full circle. The Royal Concert Hall is built on the site of the old Empire Theatre. When Vince arrived iN Nottingham for rehearsals, it was clear that Lonnie was far from well. His back was causing him great pain, and he was having treatment from a doctor and an osteopath. At one point, Lonnie's handlers suggested that Vince should help to hold the show together, appearing as a featured artist for half an hour, and that Lonnie would try to fill 15 minutes at the end, sitting on a stool. In the event, Lonnie, the dedictated performer, gave the audience a tremendous 75 minute show, and Vince finally realised his ambition by duetting with Lonnie for two numbers. That was Lonnie's last public performance. Little more than a week later, Vince was among the celebrities who attended Lonnie's funeral service.